All of us have this one problem in common. Off course it's a problem in varying degrees. Some have a mini one, others have a herculean one. The problem is offensive socks. But how do socks get to be such a problem anyway? Well, the good news is that feet do not naturally have any odor glands. But one thing they have is whole lot of perspiration glands - in excess of a quarter of a million in each foot. That's a lot of fountains of sweat, and according to scientists, feet can release up to a pint of salty sweat each day. Once the feet get wet and remain in any closed place, bacteria have a field day. They feed on the salty sweat and whatever else they can get on our feet, all in the comfort of our warm and snuggly shoes. Okay, so we have salt, we have sweat, and we have bacteria - where is the smell coming from? Well, whatever the bacteria consumes, it has to excrete. And that foul odor you smell when the shoes come off, are exactly that - the stuff bacteria excrete. You can be sure grandma didn't knit this pair. They are so high tech that it took computers to knit them - just like 3D printing. The coffee is infused into the polyester fiber and that fiber is knit into socks. That means that your feet are coddled in activated coffee. 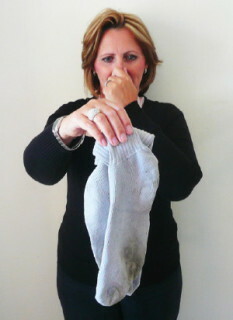 The result is a sock that is three times better at odor control than just plain cotton. The coffee is obtained from used grinds that coffee shops have in abundance. They are processed to remove the oils so there is no coffee smell in the shoe. An amazing use of used grinds. I don't buy any special socks nor do my socks ever get odoriferous. I have a bad ankle so I wear high army type boots and the only odor the boots have is leather. I did work with a women who sprayed her feet and sock a couple of times a day as she said they smelled badly. Yet I never noticed any problem. I enjoy cooking so it is not my lack of smell.